As we near the finish line and I start actually writing the historic photos book, I am repeatedly grateful for my experience with doing the text for the two West Virginia contemporary photo books I wrote for Steve Shaluta’s photos. I learned from that process that good text for photos is not text that literally describes what you are seeing — redundant — but adds value through back story information. For “West Virginia Beauty,” with its 170 plus photos, I engaged in 170 plus mini research projects. “Berkeley Springs Images” is being the same except for a larger number of photos — more than 200 — and a more demanding research task. The history needs to be correct. There’s another experience that has made the history part MUCH easier. In fact, I cannot imagine being able to do the historic photo book without this previous experience. About a decade ago, I took on the job of writing a Walking Tour of Berkeley Springs. Being manic about having to be right, and discovering that local historians tend to reject the distinction between oral memory and original documents, I set out to find the ultimate information source. I bought a microfilm reader, set it up in my living room, and spent every night from about 11pm to 2am reading the local newspaper from 1879 through 1939. Fortunately I knew enough to keep good, date-based notes. All those news notes, covering virtually the same period as our photos, have proven to be invaluable sources of both accurate and obscure pieces of information. The point? Experience pays off — and nothing you do is ever wasted. Case in point — this Tomato Festival photo we had original rejected because it seemed too staged and what would we say? Then, in reading news articles in 1939 about the festival, I discovered the photo, which was staged for the 1938 event, was picked up and used as the cover photo for the 1939 Stokes Seed Catalog — a national company. Now we had a great story to go with a good photo. We call them the Tomato Hoers. 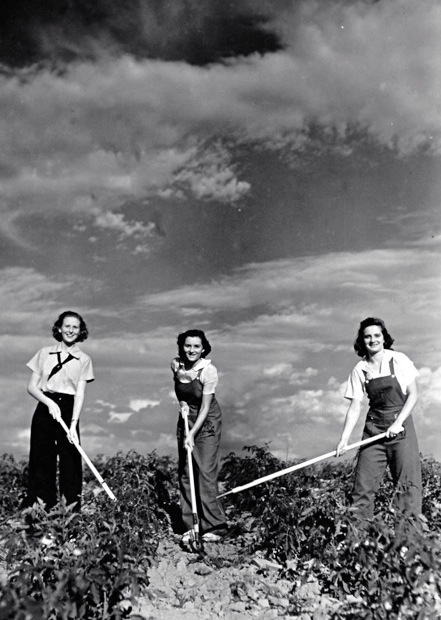 Staged or not, I love the Tomato Hoers pix.